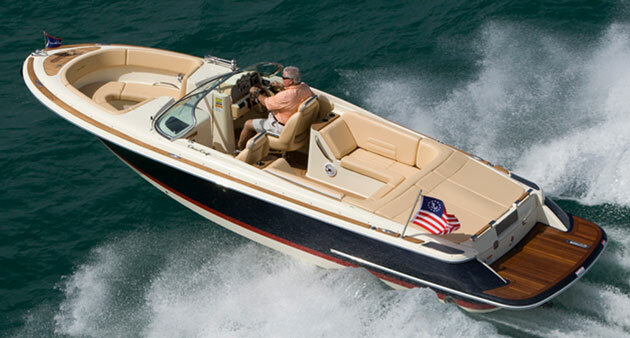 This teak-trimmed, comfortable center-console can be set up with a variety of power options. You might expect your average fishboat to be a gore-splattered, rough-and-tumble center console with plain-Jane looks, but the Catalina 26 shows that Chris-Craft doesn’t agree. This is one angling machine that’s packed with panache, served up with style, and engineered with elegance. If you’re looking for a 26-foot center console that lets you cast with class and go fishing with a flair, then smart money says the Catalina is going to make your short-list. 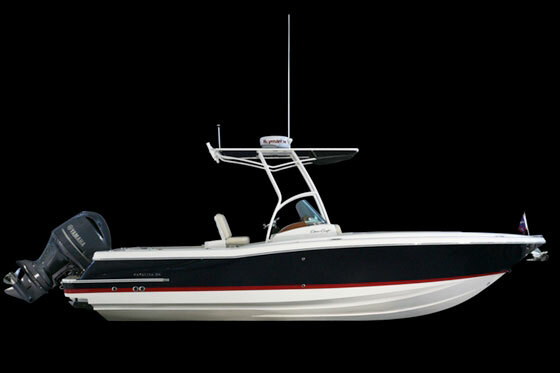 The Chris-Craft Catalina 26 center console, shown here with twin 150-hp Yamahas, combines fishing prowess with a high degree of civilization. 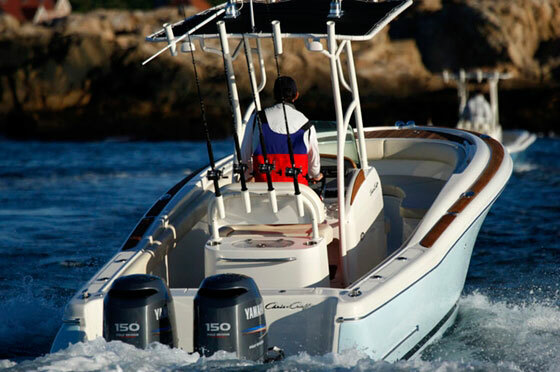 What sets the Catalina 26 apart from other high-end fishboats? For starters, teak. And lots of it. The foredeck, transom, helm, console, and gunwale caps all feature solid teak accents and decking. 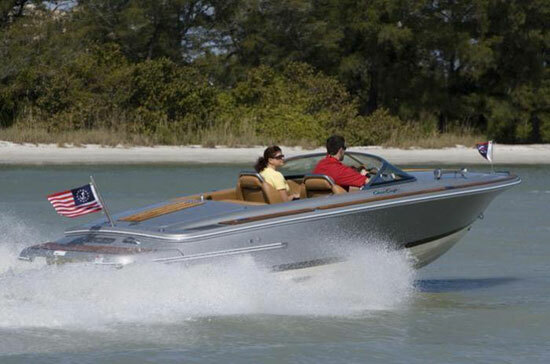 It blends into the boat’s rounded lines, which have a retro-modern look that’s unique to Chris-Craft. Of course, you can’t look stylish if you’re not comfortable. No worries on that count; the Catalina has cushy features like dual-density foam cushions, ladder-back helm seats with armrests, and a fully enclosed head console (though adding ports to the console would make it more comfortable to use). Unlike many “fishing” boats that are designed to be pleasing to the eye and comfortable to the body, styling doesn’t come at the cost of fishing features and function. That forward teak deck is perfect for light-tackle casting, and it’s surrounded by a raised fiberglass lip so you can wedge your toes against it and maintain a solid footing while you look for those rolling tarpon and breaking bluefish. The helm has a 24-gallon livewell, and a pair of macerated fishboxes with enough room for trophy-sized stripers lives in the deck. There’s a built-in tacklebox (though it’s located in the head, so accessing it is cumbersome). Rodboxes, gunwale-mounted rodholders, coaming bolsters, fresh/raw water washdowns, rocket launchers, and aft-folding jump seats are all on the equipment list. Fishy? You betcha. 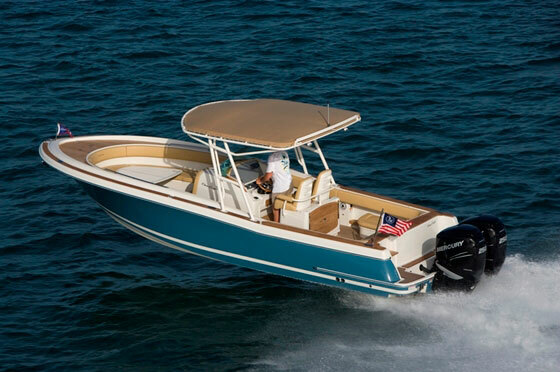 The handsome design features a 21-degree V-hull which, combined with bow flare and downturned strakes, makes for a dry and easy ride through the chop. 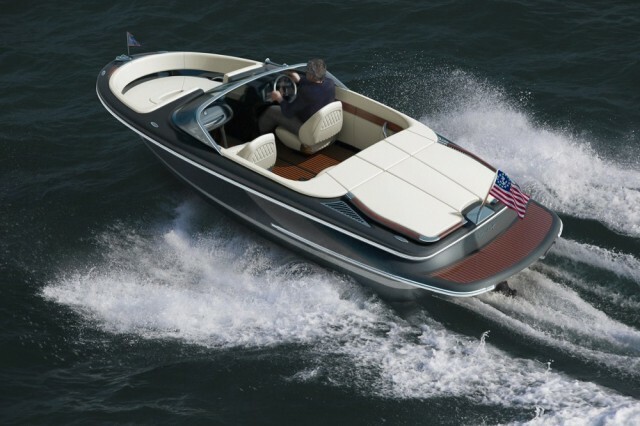 Our test boat had a single 300-hp Mercury Verado, which gave us a fuel-efficient 2.2 mpg cruise at 34.2-mph and topped out right around 50 mph. Depending on where and how you fish, you might want more speed or the dependability of a twin-engine rig. Fortunately, the Catalina 26 can be had either way. 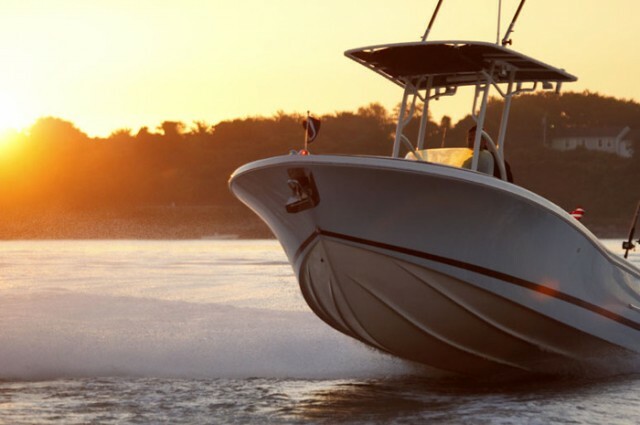 Power options include a pair of 150s or a single 350-hp outboard. 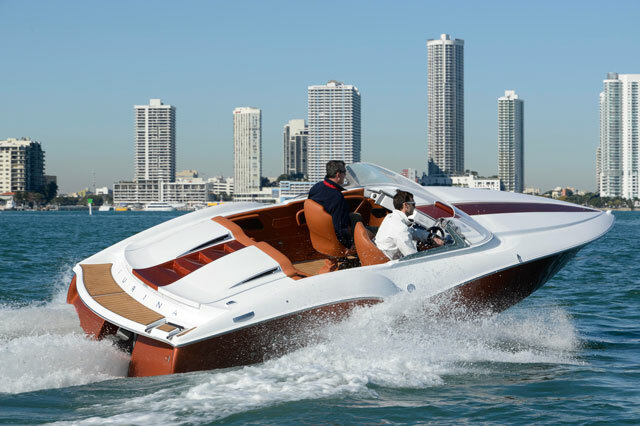 With the 350, the boat cruises at 40 and hits an eye-watering 53.2 mph. Now firewall the throttle and aim for some waves—the Catalina’s 21-degree bottom, flared bow, and downturned inner and outer strakes all work together to slash open waves and throw spray off to the sides. Not a drop of spray reached the windshield during our test, and the boat ran through two-foot boat wakes as smoothly as a Lexus coasting down the highway. Part of the credit for the smooth running also goes to Chris-Craft’s construction techniques. The liner is integrated with the stringer grid, and all voids below deck level are pumped full of sound-deadening foam. Strakes, the keel, and the transom are reinforced with unidirectional tri-axial and quad-axial fiberglass and/or Kevlar. Hatches are RTM molded so they’re light but strong, and are fully finished on both sides. Even the upholstery construction is a cut above the norm, with double-stitched piping and water-eliminating bio-bags wrapping the foam. Despite its gentrified nature, can you still splatter this boat with fish gore, squid ink, and chum splatters? Of course you can. But try as you might, you’ll still look more GQ than Captain Quint when you’re fishing from a Catalina 26.